I’d never tried anything from Coastal Scents before I got these brushes. I’d actually never even HEARD of Coastal Scents before this last year. I somehow stumbled upon THE DOPPELGÄNGER, and she frequently used shadows from Coastal Scents, so I took a look. Wait. Did you go and look at THE DOPPELGÄNGER? Please. Do yourself a favor, and take a look at what she does. Her photos, her styling, her makeup, her everything is so gorgeous, it’s sick. Anyways! Seeing the prices at Coastal Scents made it hard to pass up the opportunity to try out their products. I placed my order during their Black Friday sale; I paid $2.48 for the fan brush, and $6.48 for the kabuki brush. Crazy, right? Also seems suspicious, right? Suspiciously cheap. Like, a brace yourself for “you get what you pay for!” situation. My order did take a little while to arrive, but, since most of the things I’ve read about Coastal Scents says they ship quickly, I’m chalking that up to a Black Friday pileup. When my order came in, I was really, REALLY impressed by the weight of the brushes. They don’t feel cheap, they feel solid. The bristles are thick, soft, and fluffy. I gave the brushes a good washing, and they held up really well without any changes to the bristles. At first, I did experience a very minor amount of shedding, but that seems to have stopped. Honestly, I’ve seen worse shedding from some MAC brushes. The Classic Fan Natural brush was shockingly large and full. I’ve been using it as a really effective finishing brush to pop a little highlighting powder on my cheekbones, or to give my face one last pass with my HD finishing powder. It’s also great for brushing away any eyeshadow fallout you might have on your cheeks. Just sweeps it right off! The Natural Tapered Kabuki Stick brush was also more substantial than I expected. The full, tapered brush is perfect for contouring and blending. I use it with both liquid and powder contour colors with equally great results. I knew my contouring was on point with this brush when my grandma said to me, “I can tell you’re losing weight. I can see it in your face.” My grandma does NOT hand out those “you look thinner” compliments unless she really thinks it’s true, so, JOKE’S ON YOU, NANA. I have not lost weight, I ate 3 cookies for 4th Meal last night. Overall, I’m super happy with my brush purchase. The quality is great, and the prices are crazy! Right now, Coastal Scents is having a 40% off everything New Year’s sale. Today is the last day, but you can still get both of these brushes. I’ve found that buying and using new brushes is a great way to improve your application skills. You can learn how to get better by experimenting with new tools! Plus, hello, super fun! These prices are also good if there is a technique or type of brush you’ve been curious about, but you’ve been hesitant to spend the money. Just be sure to always wash and thoroughly dry new brushes before using them! ***UPDATE*** Both of these brushes are shedding, with the Kabuki brush being the biggest offender. 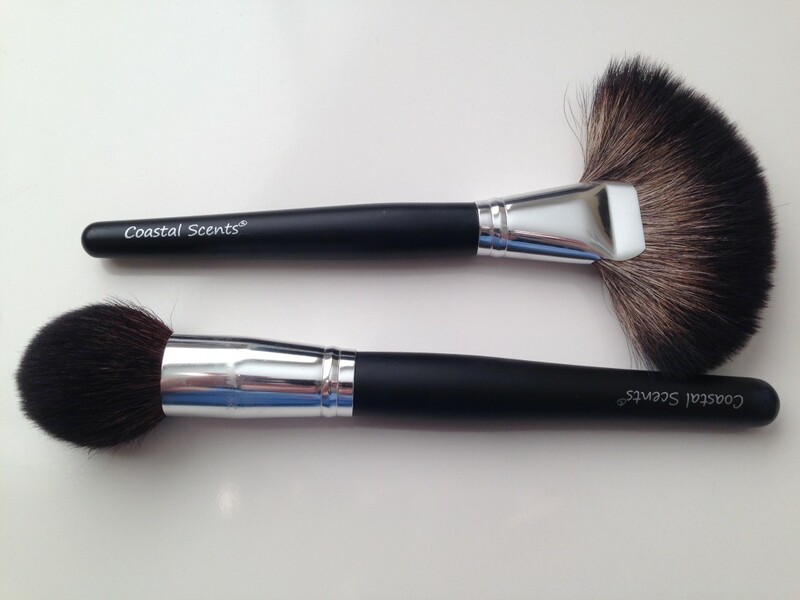 I’m still using them, but I expect more shedding with each wash.
Buy brushes from Coastal Scents HERE. Cleaning Your Brushes: Bacteria and YOU!